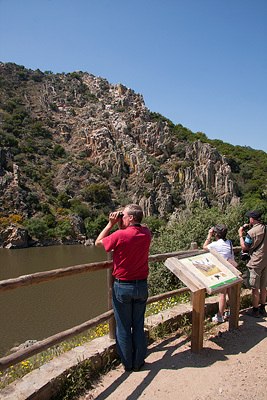 “Like Paradise.” The Crossbill Guide about Extremadura starts with these words. And that is for a good reason. The Extremaduran spring is full of life. Fields filled with blooming flowers in yellow, purple, white and blue are entirely overwhelming. Birds are present everywhere and the abundance of species is unprecedented. The cities are full of life and the temperature is usually pleasant. Spring is without a doubt the most beautiful time of the year in Extremadura. Summers are warm, and frequently even hot. The air humidity is low, however. That makes it possible to be active in the mornings up to around two o’clock in the afternoon. After that, it gets too warm. The evenings are long and often have a moderate temperature again. The grass dries out and turns a golden yellow. Birds are still there, but they stay quiet in the heat of the day. Autumn is surprising. When it has rained, the fields turn green once more. There is little rain required for that, but when the rain lasts, the fields start blooming. The flowers are so plentiful that it is almost like a second Spring. The dominant colours are yellow and white. Birds become active and start migrating. One by one the migratory birds pass by. The biggest attraction of these are the large numbers of cranes (more than a hundred thousand) that winter in Extremadura every year. Next to rainy days, Autumn also knows lovely sunny days with a temperature that reminds us of Spring. But it is Autumn, and that means that the weather is variable. Winter is of course colder than the other seasons. However, even Winter has those wonderful days with a temperature that allows you to have lunch outside. The days are relatively short and the nights cool, sometimes cold. The animal life here continues though. Many species, such as amphibians, do not hibernate here; they are also active in Winter. The storks come back from Africa and the vultures start nesting in January or February. Spring starts early, somewhere in March. For a fan of an active holiday, Extremadura holds many possibilities. Of course, Summer is least suited for an active holiday, but even then the summer mornings are surprisingly moderate in temperature. It is however wise to not strain yourself too hard in Summer. The rest of the year is very well-suited for many activities, and Extremadura is thus a great destination for an active holiday. On these pages we describe a number of possibilities for an active holiday, without wishing to offer a complete list of options. We will expand this list when we enter into new partnerships with local entrepreneurs to facilitate activities. Click here to fill in our booking form.